STARKVILLE, Miss. (AP) — Mississippi State’s regular season has 10 days remaining and the schedule includes two winnable games against Arkansas and Ole Miss. But no matter the outcome, the Bulldogs‘ season has fallen short of expectations. 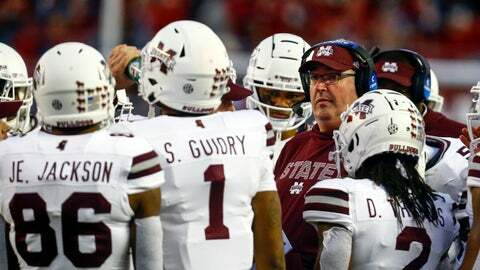 This was supposed to be the year that Mississippi State challenged for its first Southeastern Conference championship in more than 75 years. Instead, the 25th-ranked Bulldogs (6-4, 2-4 SEC, No. 16 CFP) are in fifth place. There’s little doubt it’s been a rocky first season for coach Joe Moorhead. And the reality is that Mississippi State offense hasn’t been able to generate enough points to be a true threat against the SEC’s elite teams. The Bulldogs have scored just 16 total points in their four league losses, including last weekend’s 24-0 setback to No. 1 Alabama . Mississippi State gained just 169 yards against the Tide and converted only 1 of 13 third-down opportunities. “That’s not going to help you extend drives and put points on the board,” Moorhead said. The offense has been a constant source of frustration throughout the season. The combination of Moorhead — who had two excellent seasons as Penn State’s offensive coordinator before coming to Starkville — and senior quarterback Nick Fitzgerald was supposed to help the Bulldogs put more points on the scoreboard. It’s never quite worked out. Fitzgerald has completed just 51 percent of his passes, which is his lowest mark in three years as the starter. He’s run for 816 yards, but is averaging just 4.8 yards per carry, which is also a career low. The quarterback hasn’t had much help from his receivers. Nobody on the roster has caught more than 22 passes this year and the Bulldogs have dropped several balls when there have been opportunities for big gains. Mississippi State has scored just 11.2 points and averaged 272.3 total yards in its six conference games. Both rank last in the league by a wide margin. If there’s discord among the Bulldogs, it hasn’t shown. Moorhead said it’s been a “pleasure” to coach Fitzgerald, even if the results haven’t always been what either of them wanted. The offensive struggles have been even more maddening because Mississippi State’s defense is among the nation’s best in several categories. The Bulldogs are giving up just 13.5 points per game.